Do you think you can sing? Become the next Nigerian Idol and win a USD100,000 in cash and recording contract as Nigerian Idol auditions comes to Enugu. Auditions hold on Friday tomorrow 28th and Saturday 29th October 2011 at the Universal Hotel, Independence layout by 7am. Lagos auditions hold next weekend; 4th, 5th, 6th at Dream studios Omole, Ikeja. Blackberry phones and exciting prizes to be won instantly a audition venue . 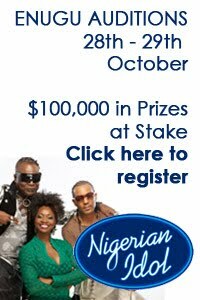 log on to www.nigerianidol.com/registration and fill the online form or just pick a form at the venue.